Essential Questions The Form of God: Fact or Fancy? Lord Krishna ‘s beauty possesses mind-attracting splendor greater than emeralds. His lustrous body resembles a dark cloud newly appearing in the sky during the rainy season. Just as the rainfall glistens, His bodily features also glisten. 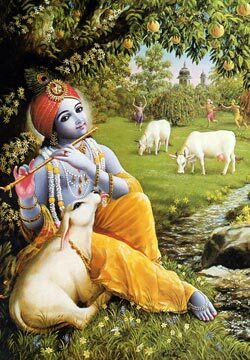 Indeed, Krishna is the sum total of all beauty. He stands gracefully with His legs crossed. His body curved, and His head tilted to the side. His yellow garment is more attractive than newly arrived lightning. A peacock feather decorates His head, and on His neck hangs a lovely necklace of brilliant pearls. Lord Krishna’s eyes defeat the beauty of white lotus flowers, and His eyebrows move slowly like bumblebees on His lotus-like face. As He takes His charming, flute to His lips and moves His fingers upon it here and there, His face looks as beautiful as the full autumn moon.